Greed knows no color or creed. What can be done in Bolehland, Malaysia can also be done elsewhere in Singapore. 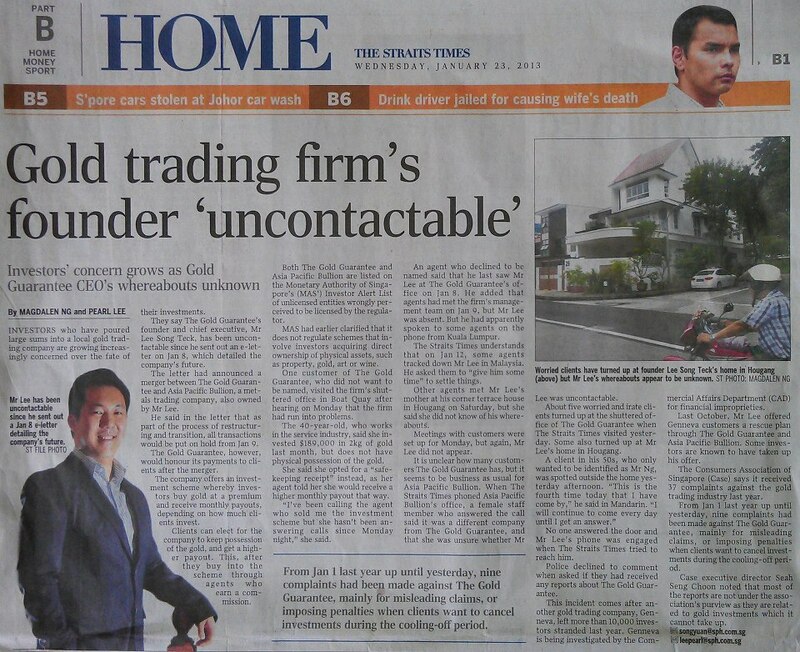 Similar business model with the rest of the Gold schemes in Malaysia. Promises monthly return by selling GOLD at a premium compared to the REAL market value.Then use the money to pay monthly dividend. The CEO suddenly "disappears" and un-contactable. On MAS (Monetary Authority of Singapore) high alert watchlist. MAS is similar to BNM. Offered help to buy/bailout Genneva investors by buying their gold or continuing their investment in Gold Guarantee instead. My take on this? Trending to be an un-sustainable business model and will leave the investor dry.